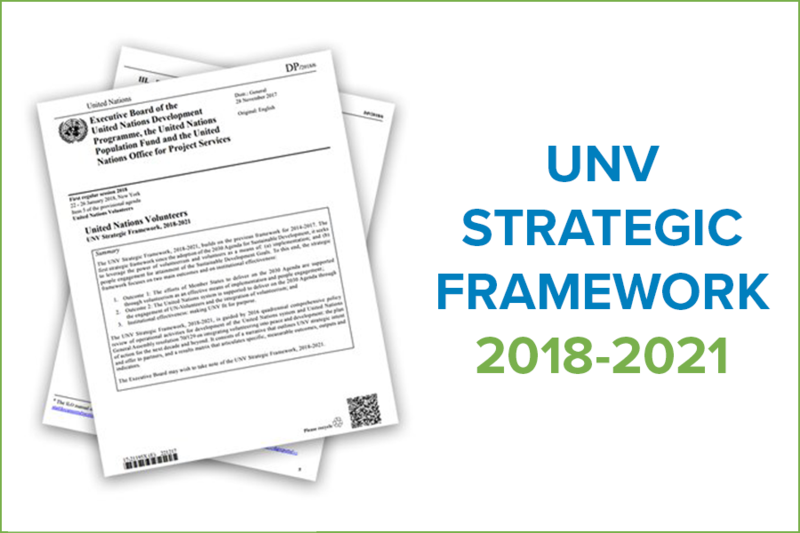 The UNV Strategic Framework, 2018-2021, builds on the previous framework for 2014-2017. The first strategic framework since the adoption of the 2030 Agenda for Sustainable Development, it seeks to leverage the power of volunteerism and volunteers as a means of implementation and people engagement for attainment of the Sustainable Development Goals (SDGs). To this end, the Strategic Framework focuses on two main outcomes and on institutional effectiveness. Outcome 1: The efforts of Member States to deliver on the 2030 Agenda are supported through volunteerism as an effective means of implementation and people engagement. Outcome 2: The United Nations system is supported to deliver on the 2030 Agenda through the engagement of UN-Volunteers and the integration of volunteerism. Institutional effectiveness: making UNV fit for purpose.